This sounds like yet another tale of malnutrition deaths concocted by activists. At least the district administration of Satna, Madhya Pradesh, thinks so. One year-old Budhlal died in the last week of July. The same week, two-year-old Sheelta, four-year-old Neetu and six-year-old Rajkumari also died. All deaths occurred in the district of Satna. The cause was malnutrition. 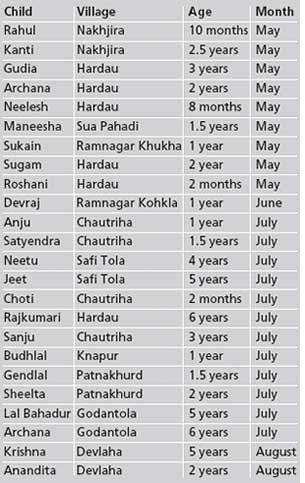 More numbers two children died in the first week of August, eight died in the first two weeks of July, one died in June and nine died in May, in the same district. This makes it a total of 24 deaths due to malnutrition in the last two months. Vikas Samvad, a Bhopal-based ngo that campaigns for right to food, recently broke the news. It claims 46 children died of malnutrition during the period in Madhya Pradesh, with most cases reported from Satna, a tribal district. The district administration is, of course, quick to disagree. It puts the cause of these deaths as jaundice, stomach infection and exposure to heat. The Block Development Officer of Majhgawan, O S Sukhware, claims all villages in his block are "malnutrition free." Nine malnutrition deaths have been reported from his block. The child development project officer of Satna, Narayan Singh, says "There have been no malnourishment deaths in the area. It's these activists who brainwash villagers into believing that their children are underfed and are dying." Of all the malnutrition deaths reported in Satna, Hardau village in Ucchera block alone has reported six. Pappu, a Kol tribal of the village, lost both his children--eight-year-old Archana and three-year-old Gudia--in May, just within the span of a week. The girls died because there was no food and it was too hot; they were very weak and high fever made their condition worse, says Pappu, who is an occasional labourer at the nearby stone quarry. Many more families and their hungry children in the village seem to be heading for a similar fate. As one walks through Hardau, one sees children with spindly arms and distended bellies, suffering from dehydration, infections, malnourishment and related ailments. In summer, the situation deteriorates, as most of the houses on this hilly terrain are made of quarry stones. Blistering heat and hunger become a fatal combination for these children, says Ramvesh Mawasi of Patnakhurd village. The tale of malnutrition and child deaths is also one of abject poverty and exploitation in Madhya Pradesh's tribal districts. The villages in Satna that have reported the maximum number of malnutrition deaths are remote hamlets, surrounded by hills and with poor road connectivity. The villagers belong to the Kol or Mawasi tribes and primarily depended on non-timber forest produce for sustenance. But the forest department does not permit them anymore. Their only other livelihood option is to work in nearby sandstone quarries, which offer them an occasional earning of Rs 20 to Rs 30 a day. As per the government norms the minimum daily wage is Rs 85 a day. Even the National Rural Employment Guarantee Scheme (nregs), meant to provide work to the rural unemployed on public infrastructure projects, provides no benefit here. Since 2005, only two kuccha roads have been made in Ucchera block. Though the job card entry shows 10-12 days of work, villagers say they had worked for just two days and received Rs 130, as against the entitlement of Rs 100 a day under nregs. The local administration says nregs is demand driven and since the villagers are illiterate, their verbal requests yield no result. This summer, the government declared the neighbouring Nakhjira and Khiria Pukhri villages as 'drought hit'. But villagers say the distribution of aid was ad hoc; the compensation amount was through cheques and the beneficiaries don't have money to travel 40 kms to a bank in the block headquarters and cash them. Children are the worst affected. Though a Supreme Court order mandates mid-day meal for all children in drought-hit areas, villagers say schools where the meals are distributed rarely open. Preventive child care is inadequate in most villages in Satna despite the administration's claims that government infrastructure for anganwadi centre (child care centre) exists. One can make out the level of nourishment among children from the state of these kuccha makeshift centres. This correspondent found that anganwadis in Hardau and Khirhai Pukhri villages lacked basic facilities as mandated under the integrated child development services (icds) such as drinking water, toilets or space to cook nutritious food. There was neither a single weighing machine to monitor the growth of children, nor the stock of essential medicines like iron and folic acid tablets, de-worming and stomach ailment tablets. Add-ons like recreational and educational charts and toys were beyond imagination. Records at these centres, where the nutritional status of infants is supposed to be monitored, were far from complete. From here begins the under-reporting of infant deaths and their cause malnourishment. Local anganwadi workers say, between February and May their centres did not receive any supplementary nutritious food, which is supplied by the government. "Only recently we received 300 kg of wheat, that too, fungus infected. The stock is insufficient to feed so many hungry children in the village," said Bhagmati, the anganwadi worker in Hardau, Purena panchayat. Five children from the panchayat reportedly died of malnutrition in May. When activists from Vikas Samvad visited these villages in July and checked the weight of children below five years using icds weighing machines, they found that 30 per cent of the children were severely malnourished (classified as grade iii and iv) and 42 per cent had moderate malnutrition (grade i and ii); Only 26 per cent children were of normal health. But the District Women and Child Development Officer, M L Mehra, refuses to acknowledge this and says "Our record says all the children in the villages are healthy, none of them remotely in grade iii or grade iv malnourishment." Till the third week of July, the district collector of Satna, Vijay Anand Kurien, had not visited any of the villages that reported malnutrition deaths of children. He said that he was busy organizing the electoral rolls. Ever since the media highlighted malnutrition deaths in Satna, the district administration has sprung into action. It has dumped food grains randomly at anganwadi centres in Hardau, Nakhjira, Ramnagar Khukha and Sua Pahadi villages, hurriedly revving up various government schemes.